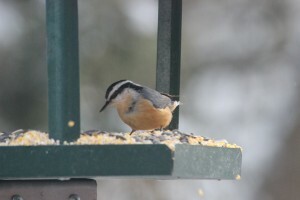 1) This red-breasted nuthatch has been a regular visitor at my feeders. 4) I’m having fun knitting for my sister’s 6-month old and my brother’s upcoming new addition. Little projects are fun! 5) My first book for the year is Marcus Zusack’s The Underdog. This is the book that comes before Fighting Ruben Wolfe, and Getting the Girl, both of which I love. I recommend this whole trilogy.